Enviroporta protects you, by reducing radon that you breathe at home or at work. You, your spouse, your children, co workers or pets are the first beneficiary of the repairs that Enviroporta does to your home or workplace. 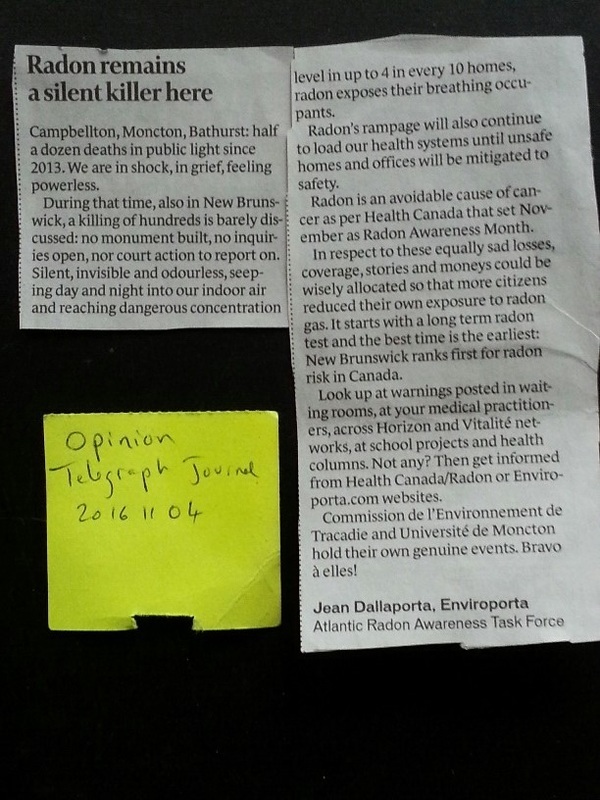 Health Canada along with MD provides the public with ample radon facts, some of which are relayed here. Health authorities inform the public. Enviroporta can repair your house for radon. We have shown leadership in being the first certified radon professional in the most vulnerable area of Canada for radon. 3: AFTER MITIGATION WAS COMPLETED: BREATHE SAFE AND ENTER DRAW FOR 2 CHANCES TO EARN $1 000 BACK. Details 506 850 5510 /CARST SWEEPSTACKE. November is radon awareness Month. Look up 2017 11 06 Telegraph journal C6. Radon, just like air temperature, is a natural condition however, lungs are not equipped with such sensitive nerves. As a consequence, many more people die from indoor air radon induced lung cancer than from cold indoor air. Our properly designed radon mitigation systems will cost like a heating system to install, yet will consume as little electricity as a light bulb, so around $5 to $10 per Month. Most houses can be efficiently mitigated for radon with an energy efficient system and most clients disconnect permanently their dehumidifier after our mitigation system is running as it will also eliminate a lot of moisture also present in sub slab gas. That amount of energy is then no longer spent. Protect the vulnerable lungs of yourself, your family and your pets. Methods exist to reduce the concentration of radon indoors. Our goal at Enviroporta is to have as many dwellings, workplaces, schools and similar public places tested so as to recommend to reduce the risks of lung cancer wherever necessary. Fee depends of the building layout. We match certified competitor's fees. We aim at safer dwellings and workplaces in NB and PEI. Do you know how many women or men weekly die in New Brunswick with lung cancer after exposure to radon? Radon seeps unnoticed in their home or workplace. They do not make the front page news, neither does radon. Do we die for being too cold in our houses in winter? No, because we do whatever we have to do to remain comfortable. Skin has many nerves to inform the brain when heating is required for comfort. Unlike our skin, our lungs send no noticeable signal to our brain. Radon is an issue that we have to learn: Health Canada / radon is an excellent source. When seeking professional to come at your place, C-NRPP and CARST provide you with certified professionals. Jean Dallaporta, Enviroporta is also certified as NRCan Energy Efficiency Advisor and will also minimize energy loss. This recent scientific publication will take you a little further in the detail of radon impact on health and on correlation between better sealed constructions and indoor air radon concentration level.